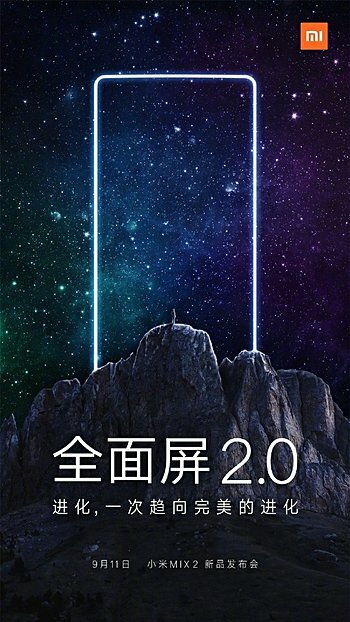 The unveiling date for Xiaomi's upcoming Mi Mix 2 smartphone has been officially confirmed. In a teaser image posted on Weibo, the Chinese company has revealed that the Mi Mix successor will be made official on September 11. Nothing else about the phone is officially confirmed at the moment, although rumors/leaks so far indicate the device may come with a dual rear-camera setup. It's likely that bezels will be even thinner this time, and the handset is also said to offer 3D facial recognition support. Talking of specs, benchmarks have revealed details like Snapdragon 835 SoC, 6GB RAM, and Android 7.1.1 Nougat. The Mi Mix 2 is rumored to sport a 6.4-inch AMOLED display with a 2540x1440px resolution, and come in 128GB and 256GB storage options. Battery capacity is said to be 4,500mAh. True that, have thought on buying lg v30 but as you say... to expensive... going / hoping on china smartphone to purchase. Last remaining hope for an upgrade this year. The V30 costs too much for me and the price will take time to go down.